We asked our customers: “What do you – as a proximity sensor user – really want in a sensor?” Some people wanted reliability in extreme conditions. But most simply wanted reliable performance in standard industrial environments. 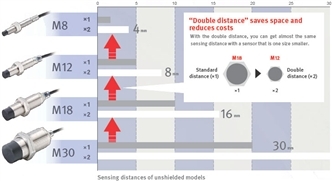 The proximity sensors promise the perfect fit to your particular needs. We have four different sizes: M8, M12, M18 and M30, each one with single or double sensing distances, shielded and unshielded. There’s also a choice of short and long bodies, two connecting methods and four output types. With this range to choose from, you’re certain to find the perfect fit. 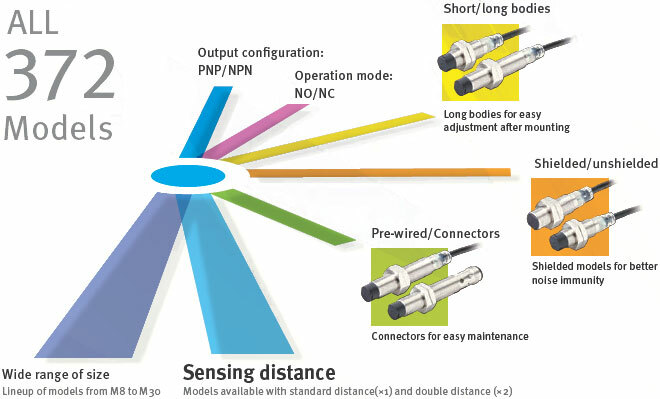 For standard conditions you can easily select photoelectric sensors because they have an easy-to-read code without complex codification. They also have a bright circular LED indicator, so you can quickly determine their operating status. These two features reduce the effort in machine maintenance, so you will save time and money. 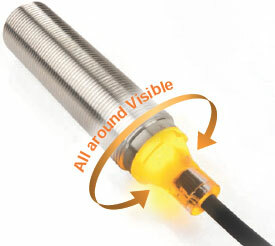 Easy visibility for 360° even in dark locations so you can mount the sensor in any direction. Pre-wired models (standard is 4 mm dia. PVC cable with length = 2 m, 5 m). Standard cable is 4 mm dia. PVC.